Today (February 3, 2015) is the anniversary of the sinking of the ship U.S.S. Dorchester. The ship was an Army Transport headed for the American base in Greenland in 1943. Word War II was raging and the ship was part of a convoy that was supposed to protect it from roving Nazi U-boats. Aboard the Dorchester were four Army chaplains: Reverend George Fox (Methodist), Jewish Rabbi Alexander Goode, Reverend Clark Poling (Dutch Reformed), and Father John Washington (Roman Catholic). Around midnight, a U-boat discovered the convoy and fired upon it, hitting the Dorchester and damaging it badly. The ship was sinking. All nine hundred men aboard the ship scrambled to get off. Only two hundred thirty men survived. Among those lost that day were the four chaplains who, on their way to safety, stopped to direct their fellow soldiers to safety. Before they themselves could escape the dying ship, however, they each met a man who had no lifejacket. Each chaplain then removed their own lifejackets and handed them over to the four men who had no life preservers. The men escaped while the four chaplains stood on the deck and prayed as they went down with the doomed ship. Today, these brave chaplains are barely remembered for their sacrificial heroism. The American Legion still remembers them, as it works to make sure that no American soldier from any war is ever forgotten. I hope this post will help to keep these courageous chaplains’ deeds in public memory in some small way as, around the country, others remember the four chaplains who gave their lives so others could live. May they never be forgotten! 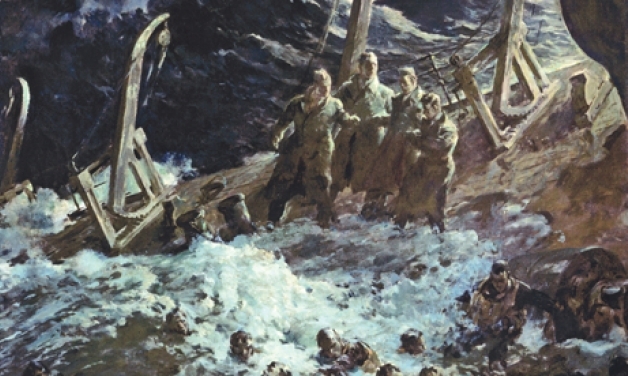 This entry was posted in Holidays and tagged army chaplains, Dutch Reformed, Father John Washington, February 3, Four Chaplains, Jesish, lifejackets, Methodist, Rabbi Alexander Goode, Reverend Clark Poling, Reverend George Fox, Roman Catholic, sacrificial heroism, safety, soldiers, The American Legion, The Four Chaplains. Holidays, true heroism, U-boat, U.S.S. Dorchester, World War II on February 3, 2016 by The Mithril Guardian.